Genetic Resources of Pumpkins and Squash, Cucurbita spp. Pumpkins and squash, Cucurbita species, can be found in fruit and vegetable markets almost everywhere. Cucurbita is native to the Americas and was first domesticated there approximately 10,000 years ago. Immediately subsequent to the first European contacts with the Americas, Cucurbita was dispersed by people to other continents. Five species of Cucurbita have been domesticated, the most widely cultivated of these being C. pepo, C. maxima, and C. moschata. Cucurbita plants are large and develop rapidly, and are primarily grown for consumption of their young or mature fruits, seeds, extraction of oil from the seeds, and ornament. Cucurbita contains a wealth of genetic variation in fruit size, shape, color, flavor, and nutritional value. Although many cultivar-groups and market types of Cucurbita originated in the Americas, some originated in Europe. 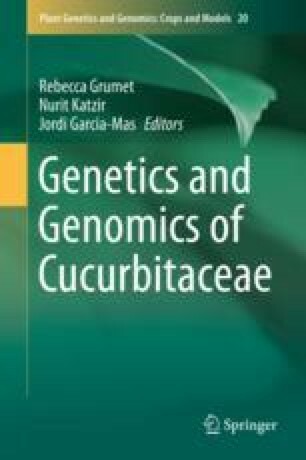 Modern breeding and genetic enhancement of Cucurbita is focused mainly on increased yield, disease resistance, and improved immature and mature fruit quality. Cucurbita genetic resources are maintained in large collections in a dozen countries. Enhancement of fruit flavor and quality has been a long-time primary focus of breeding at publicly funded institutions but further achievements are in danger of being lost due to non-replacement of retiring personnel combined with a lack of organized conservation, description, and deposition of their enhanced-germplasm collections.